A new tortilla-stuffer with some serious bite (just ask Evander! ), Tyson's Tacos spruces up former tenant Jalapeno Joe's patio decor and expands on JJ's very affordable menu ($.99 migas! 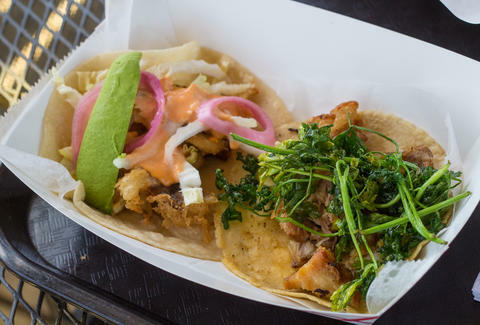 ), with additional tacos like pork belly (w/ fried parsley & salsa taquera), baby back ribs (w/ pineapple salsa), and fried drum (w/ slaw, avocado, escabeche & Sriracha), as well as burgers featuring half-pound, house-ground rib eye.